Out of deep appreciation for Breathin' is Beilevin', BZN is offering the following opportunity to all those who feel the same! 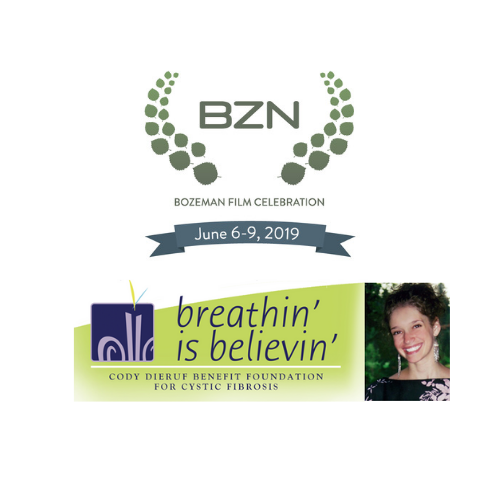 25% of your All-Access Film Festival Pass purchase will go directly to Breathin' is Beilevin' - The Cody Dieruf Benefit Foundation for Cystic Fibrosis. Effective until April 15, 2019. Join us for a four-day event celebrating independent filmmaking, creative expression, and emerging and established voices. The BZN International Film Festival showcases films that educate, encourage and inspire audiences to get involved and take action to protect our planet. In addition, BZN focuses on writers, directors, actors and producers who understand that film is a powerful medium to convey dreams and passions, with a special spotlight on female filmmakers ready to take the helm, pioneering projects to change current statistics and elevate women’s visions and voices. Over 60 films will screen at various theaters throughout downtown Bozeman, Montana, complemented by a rich slate of Q & A sessions, panel discussions, community-wide events and parties. Additional events include the Opening Film and Reception on Thursday, Family Free Night on Saturday, and Awards Ceremony and Filmmakers Brunch on Sunday. For more information, please visit our website at bozemanfilmcelebration.com. There are three levels of all-access passes – Gallatin Peak Pass, Hyalite Peak Pass and Bridger Peak Day Passes. Each pass offers tiered access to films, seminars, events and parties throughout the Festival. The Gallatin Peak Pass allows the holder to enter all screenings and seminars throughout the festival dates including the Opening Night film and catered reception. Gallatin Peak Passholders are invited to Friday and Saturday evening receptions at Old Main Gallery for lite bites and libations with a featured artist along with the Filmmakers Brunch at The Rialto Bozeman followed by the Awards Ceremony on Sunday. Gallatin Peak Passholders are entitled to local restaurant and community promotions organized by BZN throughout the festival dates. The Hyalite Peak Pass allows the holder to enter all screenings and seminars throughout the festival dates including the Opening Night film and catered reception. Film screening entrance is on a first-come, first–serve basis. Hyalite Peak Passholders are invited to the Awards Ceremony on Sunday and are entitled to local restaurant and community promotions organized by BZN throughout the festival dates. Thursday’s pass allows Passholder to attend Opening Night film and catered reception. Film screening entrance is on a first-come, first–serve basis, following the Hyalite Peak and Gallatin Peak Passholders. Bridger Peak Passholders are invited to the Awards Ceremony on Sunday and are entitled to local restaurant and community promotions organized by BZN throughout the festival dates. The Bridger Peak Day Pass allows the holder to enter all screenings and seminars on the requested day – Friday or Saturday. Film screening entrance is on a first-come, first–serve basis. Bridger Peak Passholders are invited to the Awards Ceremony on Sunday and are entitled to local restaurant and community promotions organized by BZN throughout the festival dates. BZN welcomes film lovers of all ages. While some films may be unsuitable for younger audiences, BZN will screen films for children and young families. Visit our website (bozemanfilmcelebration.com) for a full list of events including a Family Free Night on Saturday. We encourage carpooling or the use of rideshare companies. Parking can be tight in downtown Bozeman. There is free 2 hour parking on the street and a parking garage located at the corner of East Mendenhall Street and North Black Avenue. We welcome any questions or concerns. Please email us at [email protected] and a member of our staff will be in touch shortly. BZN does not issue refunds for Pass or Ticket Sales. BZN Passes are non-transferrable, and tickets reserved for a Passholder may not be transferred.